Bring 4 quarts of salted water to a boil and add frozen Edamame. Cook 5 minutes and set aside to drain. In an electric frying pan ordutch oven, heat oil, crushed pepper and garlic, over medium high heat, 1 minute. Add onion and bell pepper, cook 2 minutes and add cubed potatoes and carrots. Cook mixture, stirring frequently until crisp tender, about 8 to 10 minutes. Add Edamame, mushrooms, and tomatoes. Reduce heat to medium low and cook 5 minutes. 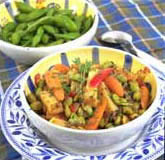 Add vermouth and remaining ingredients and simmer vegetables 5 minutes, or until ready to serve.